In our commitment to present you with only the best products based on your skin type, we have assessed and rated 5 facial masks for oily skin that are creating a buzz in the market. We then picked out what we feel is the best face mask for oily skin based on its skin compatibility, ability to control shine, ease of application, and its friendliness on the budget. The Clear Improvement Active Charcoal Mask to Clear Pores by Origins is a keeper. It contains charcoal, a “black diamond” that has been used since 1486 for its purifying properties. Peter Thomas Roth’s Sulfur Cooling Masque is another keeper. Its Bentonite and Kaolin clays, Eucalyptus, and Sulfur contents combine to fight oil and acne, and has Aloe Vera to calm skin. Mint and lemon lovers should try the Mint & Lemon Clay Mask by Freeman. It helps minimize large pores and shine while relieving inflammation caused by breakouts. Elizavecca’s Kangsipack is an interesting product because of its 24k gold content. Filled with natural herbal ingredients, this mask is good for the management of pores and exfoliation. The Clay Mud Mask by der﻿ma-nu ageless skin remedies is a 100% organic and natural product. Made with Kaolin Clay, it effectively minimizes pores and cleans deep to prevent blackheads. Below is the selection of the best face masks for oily skin we're too excited not to share. Because it uses charcoal as its main ingredient, this, for us, is the best face mask for oily skin. Charcoal has been used for centuries for its power to draw out impurities, debris, and dirt. And by centuries, we mean as early as 1486. Aside from charcoal, this mask contains White China Clay and Lecithin. The former is known to absorb harmful toxins while lecithin is known to dissolve impurities. The sulfur content of this product makes it one the best face masks for oily skin. Sulfur is known to treat and prevent acne while its clays and Aloe Vera contents absorb oil and calm the skin. This mask is also enriched with eucalyptus oil. Known for its antibacterial properties, eucalyptus oil adds up to this powerhouse by preventing future breakouts. This cooling masque also delivers quick results. It is effective and strong, yet gentle enough for sensitive skin. As this mask’s clay absorbs oil to reduce large pores and shine, its mint and lemon extracts work to keep skin refreshed and cool. With its botanical and natural ingredients, you can bid oily skin goodbye without the harsh chemicals. It also helps with whiteheads and blackheads for that super clean and clear face. It works great on men and women. In fact, you’ll see a difference after your first wash.It also doesn’t burn your eyes and can easily be washed off with warm water. This mask makes use of natural ingredients to help control oil. With added 24k gold, this can give your skin a unique glow. Aside from its 24k gold content, this product also contains ceramides. It has great moisture retention properties that help fight wrinkles. Another cool thing about this product is that it changes its color once it dries (from gold to white.) It sounds childish, but hey, isn’t that awesome? This Kaolin Clay Mud Mask contains high-quality skin nutrients to ensure that you only get the best results from this facial. Great for all skin types, it only makes use of 100% organic and natural ingredients. This acne mineral mask can also be used on the body for healthy skin all over. But this mask isn’t just for oily skin. It is also a great cleanser, moisturizer, and tool for improving your complexion. While a ton of face masks are available in the market today, you should remember that they are not created equal. Face masks, like your other facial products, should complement your skin type. But should you really use a face mask? You basically just peel it off after allowing it to dry and harden after a couple of minutes. The downside of this type is that it can really get messy so make sure you’re not using it anywhere near white tiles. For oily skin and skin that is prone to acne, clay masks are a sure bet. These masks help by balancing out the oils in the skin by tightening pores and controlling excess sebum production. Another reason that makes them ideal for this skin type is that they help soften and smoothen the surface of the skin and because of their mattifying effect. Oily-skin people could also look for masks containing charcoal. This ingredient works by picking the excess oil on the skin, which makes you prone to breakouts and an extremely dewy face. Masks containing enzymes work great if you suffer from clogged pores. They strip away dead skin and debris by breaking down the bonds between cells. Clean up your diet. Fruits like kiwifruits and lemons are known to contribute to clearer skin, so you may consider adding them to your diet. You may also want to eat more whole grains, beans, and nuts, because lack of Vitamins B2 and B5 is also a possible cause of oily skin. Test different products. Dermatologists recommend choosing oil and wax-free products, and if you have sensitive and oily skin, go for fragrance-free products and avoid bar soaps. Take it easy. Always use tap to warm water when washing your face and avoid scrubbing your face as this can strip the skin of necessary oils, causing rashes and burns. Make sure not to overwash as this can dry out the skin, urging the oil glands to produce more oil. Stick to washing your face 2 to 3 times a day. Toning. Toners lower the pH of the skin and help remove any traces of dirt cleansers left behind. Do this once a day. Moisturize, moisturize, moisturize! Oil-, lipid-, and wax-free moisturizers work best for oily skin. You can never go wrong with clay. However, be sure not to replace your entire beauty regimen with masks. Using them once a week is more than enough. Stay away from harsh treatments. These include facials and microdermabrasion, as these clean only the skin’s topmost layer and can even cause breakouts in 80% of people. The power of exfoliation. This should be done at least once a week as exfoliating can help get rid of clogged pores and dead skin cells. Use topical creams. Sulfur, Vitamin A, and Retinoid creams are a few options for people with oily skin. If none still seem to work, a trip to the dermatologist won’t hurt either. We know how frustrating it is to deal with oily skin. It is definitely a no laughing matter because choosing the wrong product can really break you big time. And we mean it literally and figuratively. 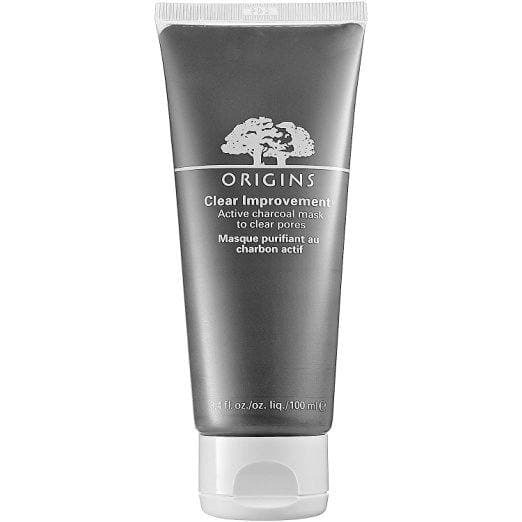 We chose the Clear Improvement Active Charcoal Mask to Clear Pores by Origins as the best face mask for oily skin. This mask contains Bamboo Charcoal, known to be an effective pore de-clogger. It also contains lecithin which dissolves impurities and White China Clay that absorbs harmful toxins. If you want something effective yet isn’t so harsh, this product’s definitely it. The downside, however, is that it is on the pricey end. But we believe this is something that can be overlooked because you’ll definitely be getting your money’s worth.